For other places with the same name, see Long Island (disambiguation). Long Island is an island stretching eastward from New York City in the Metro New York region. The largely suburban area is approximately 115 miles long from Brooklyn and Queens at the western end, to Montauk at the easternmost point. At its widest the island is approximately 20 miles from north to south. While Long Island geographically includes Brooklyn and Queens, politically Long Island in general only includes Nassau County and Suffolk County of New York State only. While Long Island is home to seven million year-round locals, many commuting in and out of New York City, the Island is home to a lot of discreet tourism (concentrated in certain towns—Huntington, Fire Island, Montauk) and also serves as the zip code for the vacation homes of many wealthy city dwellers, particularly in the Hamptons. Geographically, Queen and Brooklyn are part of Long Island but are usually associated more as 2 of the 5 New York City boroughs. When Long Islanders talk about Long Island they are typically referring to only Nassau and Suffolk County. Long Island is essentially a suburban area throughout (except for the Twin Forks region, which is rural) and has few major towns. From a tourist's point of view, Long Island is most ideal to visit in the summer due to all the beaches, but no matter the season there is always something to do. Long Island is great place to visit whether it be for a family vacation, a group of 20-somethings looking to rent a summer house, or an older retired couple looking to enjoy some natural sight-seeing or tour a museum. Nassau County and Western Suffolk County is very developed and densely populated, and is home more to the 'suburbia' type neighborhoods Long Island became famous for after World War II, where most year-round residents live. (i.e. Levittown, Oceanside). Central and Eastern Suffolk County, however, is somewhat rural (for the New York area, anyway) and is home to much agriculture, wineries, and beach towns. Many summer homes and hotels are located here, and is where most wealthy New Yorkers congregate in the summer months when the concrete jungle is too hot to bear. Tourist attractions can be found equally in both counties and throughout the entire Island. Long Island's only downside to tourism is harsh north-eastern winters that make traveling somewhat difficult, and the fact that it is an expensive place to both live as a permanent resident and also as a tourist. There are towns that are more friendly to the wallet than the notoriously expensive Hamptons, or "Gold Coast" North Shore towns, however, Long Island is home to some of the most expensive zip codes in the entire world. Do not expect a bargain vacation when traveling to Long Island, or anywhere in the New York Metropolitan area for that matter. For those that wish to make Long Island their home, it should be pointed out that Long Island is the most expensive place in the United States to live due to the high cost of living, 8th highest electric rates, high taxes on fuel and gasoline, very high property taxes and astronomical home prices. The Long Island Conventions & Visitors Bureau  provides information about Long Island and the places to visit. MacArthur Airport (IATA: ISP) in Islip is a convenient regional airport centrally located on Long Island. The primary carrier flying in and out of this airport is the low-cost carrier Southwest Airlines. John F. Kennedy International Airport (IATA: JFK),  is convenient because the AirTrain connects JFK's people mover system to the LIRR at Jamaica or Howard Beach Stations for only $5. LaGuardia Airport (IATA: LGA), . Newark Liberty International Airport (IATA: EWR),  is located to the west of the Island (and New York City) in the state of New Jersey. There are several ferry services that can be found on Long Island. The Bridgeport and Port Jefferson Steamboat Company service for passengers, cars and trucks. Children ride for free! Contact: 1-888-44FERRY. Cross Sound Ferry service for passengers and cars. Contact: 860-443-5281. Viking Fleet Ferry is for passengers only and bicycles are accommodated. Contact: 631-668-5700. South Ferry, Inc. is also available year-round and allows passengers, cars and trucks. Contact: 516-749-1200. Davis Park Ferry Co. Inc. does not allow vehicles and is available from March to September. Contact: 631-475-1665. Fire Island Ferries does not allow vehicles and has limited services year-round weather permitting. Contact: 516-665-3600. Sayville Ferry Service does not allow vehicles and is available April to November. Contact: 516-589-0810. Sunken Forest Ferry Service does not allow vehicles and is available May to October. Contact: 516-589-0810. There are many controlled-access highways that run through New York City from Connecticut and New Jersey. It is advisable, however, to travel on routes that do not cross Manhattan Island (where traffic is perpetually horrendous). From New Jersey, I-278 runs across Staten Island to Brooklyn where major roads (including Route 27 and the LIE) can be reached. From Connecticut, take I-95 South to I-295 and the Throgs Neck Bridge. Once into Queens, nearly every major thoroughfare is encountered while still heading south on I-278. A convenient way to bypass most traffic is to take a car ferry from either Bridgeport, CT to Port Jefferson (on the North Shore in the center of Suffolk County)  or New London, CT to Orient Point (on the North Fork). However, always check the ferry schedules while they do not operate overnight. The Southern State Parkway (SSP) runs from East Islip to Queens where it becomes the Belt Parkway. The SSP is a very busy thoroughfare during rush hours and connects most of Nassau to each other. The Northern State Parkway connects Queens with the Grand Central Parkway. The Long Island Expressway (I-495), or The LIE is billed as the world's longest parking lot, especially during peak rush hours. The LIE connects Manhattan to Riverhead. Sunrise Highway, or NY-27, as a divided highway goes from Queens along the south shore of Nassau County, becoming an expressway in Babylon, back to a divided highway in Suffolk County and ending at the east end of the island in Montauk. It should be pointed out that no commercial traffic is allowed on the parkways because of the low bridges. When traveling along the North Shore, you may take the scenic and relaxing route of 25-A, a single lane road that runs through historic, wealthy towns on the northern shore. Please understand that Long Island is a very large island. At 118 miles in length, it can take hours to travel from one destination to another, especially during morning and afternoon rush hour when the main roads suffer from high congestion and the trains are crowded. Easy Access Limousine offers luxurious ground transportation for both personal and corporate clients in Long Island and the surrounding areas. They have been providing professional car service for over five years to corporate, tourists and local clients. Winston Transportation is the largest individual transportation operator on Long Island. Winston has been providing the Long Island/NYC area with affordable, reliable transportation since 1973. Service to and from airports, cruise terminals, point-to-point, and all events. Aaron Limousines Ltd offers dignified ground transportation for residents and visiting clients in Nassau County and Suffolk County as well as to trips to and from the five borroughs. They are the most dependable transportation company in all of Long Island for over a decade. The Long Island Rail Road crosses the entire island, with stops in virtually every community of note. Please not that it is designed to take residents into and out of Manhattan, so connections between branches are virtually nonexistent. However, with the exception of the Port Washington line, every branch does come into Jamaica station in Queens, so if you do need to change branches, Jamaica is where you will likely do it. The Port Jefferson branch goes all the way out to Port Jefferson on the north shore in Suffolk County. The Ronkonkoma branch goes to Greenport on the north fork. The Montauk branch goes to its namesake hamlet on the tip of the south fork. The Hempstead and West Hempstead branches go into the heart of Nassau County. The Far Rockaway and Long Beach branches carry beach goers from the city to the popular beaches on the south shore. The Long Island Expressway (the L.I.E.) has the high-occupancy-vehicle (HOV) lanes in both directions in Nassau and western Suffolk Counties. From 6 am to 10 am and 3 pm to 8 pm from Monday to Friday, it can save time for motorcycles (even without passengers) and cars with at least two occupants. It is extremely recommended that you use an HOV lane if possible! Traffic jams can last for hours and disrupt travel plans. Just make sure that you know what exit you will get off at. There are only certain points at which you can get out of the HOV  lane. The Meadowbrook Parkway runs from Jones Beach, through Long Beach connecting the South Shore towns to Mineola and The Northern Parkway. The vast majority of Long Islanders speak English as their first and primary language, however there are significant communities of Spanish, Italian, Russian, and Polish speakers in various areas. While visiting Long Island, natives will expect to be spoken to in English, and while Spanish, Italian, and French are taught in the majority of Long Island schools, most Long Islanders will have limited, but some knowledge, and may be able to converse with you in your language. The Long Island dialect of English is very similar to the English spoken in Northern New Jersey and New York City, yet still with some differences. The average tourist will not be able to tell a Long Islander from someone from Brooklyn or Queens, but to natives the dialects are clearly distinct. Some features of a Long Island dialect would be the absence of the Mary-marry-merry merger, the absence of the cot-caught merger, nasal tones, and the emphasis on consonants such as "g" (as evident in "Long Island" being pronounced "Lawn Guyland" by a native Long Islander with a heavy accent). Despite these differences, a Long Island dialect will still be fairly easy to understand for other Americans and Canadians, and although harder for Brits or Australians, still generally understandable. The primary tourist attractions are the large number of excellent beaches along Long Island Sound on the North Shore (the setting of the famous novel and movie "The Great Gatsby", and the more famous South Shore, which is home to the Atlantic Ocean's waves and white-sand beaches. The North Fork is also home to many wineries, farms and culinary outlets. Other attractions include North Shore harbor towns such as Port Jefferson, Huntington Village, Stony Brook and Northport where a variety of eateries and small businesses thrive in a bohemian atmosphere. The Hamptons on the South Fork. Long Island has some great villages, like Great Neck and Huntington, where you can just wander around and see cute little stores and take in nice views. Port Washington has a beautiful bay with a public park where you can see all the boats and the water. Beach access is restricted to residents only. Swim at any of the great South Shore/Ocean beaches. Jones, Hamptons, Montauk, Robert Moses, Smith's Point. Splurge at the 'Miracle Mile' shopping resort in Manhasset. Go bar hop through Huntington, Port Jefferson, Smithtown or Patchogue. Visit "Polish Town" in Riverhead. Drive around Old Brookville and look at how gigantic the houses are. Long Island is also the home to Stony Brook University, one of the top-100 Universities (US News and World Report), which is part of the State University of New York (SUNY) system, providing a very academic and international community within central Long Island. Brookhaven National Laboratory, affiliated with the U.S. Department of Energy, and Cold Spring Harbor Laboratory is also located on Long Island. Both labs are affiliated with Stony Brook University. Another well known university is Hofstra University located in Hempstead is the largest private university on Long Island. Long Island is also the home of Nassau County Community College, the largest community college in New York. Other noteworthy institutions of higher learning are Adelphi University, Malloy College, CW Post, NY Institute of Technology, Suffolk County Community College, Queens College, United States Merchant Marine Academy and the Webb Institute. Many major fast food chains and chain casual dining restaurants have locations on Long Island. Deer Park Avenue is said to have the most fast food places on one road. Be sure to visit a local farmstand, especially those out east and on the North Fork. Local produce and farming is a major industry on Long Island. The well known cocktail, the Long Island Iced Tea, was first created on Long Island. One of the most celebrated local beers is called Blue Point , named for the town of the same name. Drinking on Long Island is tough because you need a car to get around, with this in mind, use the Long Island Railroad to your advantage. Take it from town to town, or take a night out to go into the City. At night, there is little public transportation besides LIRR, but there are taxis. The South Shore in Nassau County has some good bars, (with a somewhat rowdy crowd, however). On the North Shore you will find a buzzing college-bar scene year-round, mostly for those college students and other 20-somethings looking for a night out that doesn't involve a dorm party, frat or sorority or an expensive trip to NYC. The most popular towns for this kind of bar-scene are Huntington Village, Port Jefferson, (both along Route 25-A) and recently Smithtown along Jericho Turnpike/Route 25, which has developed as an up and coming bar scene by night despite their charming shopping and family-oritented atmospheres by day. Montauk and Fire Island, which are very much touristy beach towns, are home to many bars—what else is there to do on a warm summer's night?! Be smart, don't travel to towns with a lot of crime at night. These towns include: Roosevelt, Hempstead, North Amityville, North Baldwin, Wyandanch, Rosedale, North Bay Shore, Central Islip, New Cassel, eastern Westbury, Uniondale and Freeport. Most notably is Brentwood and Farmingville where the gang MS-13 has been terrorizing the area for 20 years. In the daytime, these areas are generally safe but shootings can and do still happen in broad daylight. Other than those towns, which most locals could tell you is where most of the dangerous crime occurs, crime on the rest of Long Island is related to drug-arrests and burglarlies of high-end neighborhoods. Heroin usage is epidemic on Long Island. Most robberies are related to hired help, and are low-profile crimes. However, the most recent epidemic crime problem has been the increase in heroin use among Long Island teens, particularly of wealthier neighborhoods along the North Shore. Generally, this should not be a problem for a tourist. Nassau and Suffolk Counties each have a police department, as well as many local departments located throughout the island. The daily, Island-wide newspaper is Newsday, which also provides a detailed history of the island. .
News 12 on Cable TV (Cablevision) also covers local news. Long Islanders in general, do not differ greatly from others in the Northeastern region of the United States, especially those from the rest of New York and nearby New Jersey in terms of acceptable social behavior. Talking to strangers is widely uncommon and small talk is generally disdained by Long Islanders. However, the harmless act of asking for directions will likely go over okay with a Long Islander, but do not be surprised if they simply ignore you and go on with their day upon trying to talk to them. While in public, it is very important to keep your distance from strangers, as someone getting too close is often worrisome and may cause problems. While riding public transport, it is considered highly unacceptable and rude to sit directly next to someone while there are other seats available, such as on a train or bus. Despite being acceptable in other parts of the United States, striking up conversations with cashiers or just in general strangers will likely not go over well. Although the person will likely be civil towards you, do not expect them to be overly engaged in the conversation and they will likely try to end it quickly. Long Islanders are very kept to themselves in comparison to people from other parts of the country, so it should be known that unless they initiate the conversation, they will most likely feel very uncomfortable. Taking pictures of strangers without their permission or knowledge will likely go over very poorly and could lead to altercation. You may leave Long Island to go on day trips to any borough of New York City, Connecticut, New Jersey, upstate New York (another great place to visit)...however, there are so many day trips that can be spent on the Island itself with it's many unique towns and other nooks and crannies, that it is advised by locals to plan on staying on Long Island if you plan a trip here and seep into local life as much as possible. It is very common for Long Islanders to never leave the Island during summer vacations because there is so much to do in the summer even for locals. The Island itself is large, and one can live on Long Island their entire life and still find something new to do or explore on the very same island each summer. On Long Island, there is no manufactured fun. It is all about exploring the communities and natural scenery for what they are to year-round residents. Long Island is not built for tourists like Florida's Disneyworld might be, however, ironically, that makes for the best kind of tourism. 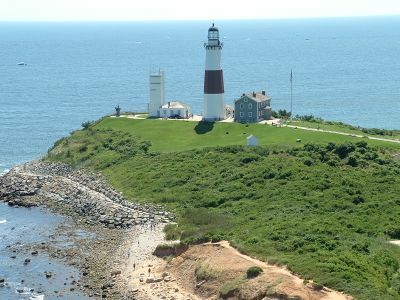 One of the biggest hot spots for tourists and vacationers alike to go to is Montauk located at the farthest eastern end of Long Island. In the summer it is a mecca for young people to drink and party during which time hotel rates quadruple in price. Getting into Montauk during the summer can take several hours by car as traffic can be backed up for miles. During the fall, winter and early spring the town is almost a ghost town and room rates are a lot more affordable. Montauk has been listed as the most expensive place to stay in New York State. This page was last edited on 11 March 2019, at 21:37.